A three-dimensional story telling exhibition was created by Gustavo Fricke to celebrate 450 years of Oaxaca history. 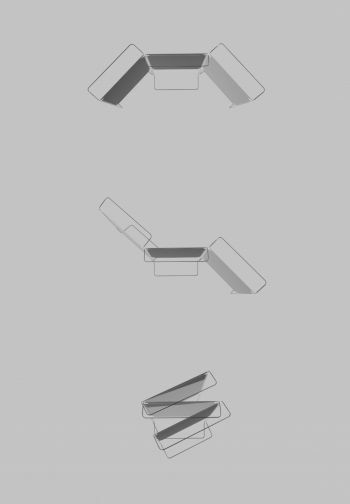 Numerous prototypes were produced with the designer stating, “…the basic concept was to obtain the largest exhibition area with a system that could collapse; making it easier to travel around the country.” Fricke produced ten exhibition modules, each with a six-face display area constructed using Dibond aluminum composite, with hinges made of nylon. The exhibit’s ability to be collapsed was for ease of transportation, as the exhibition traveled to different museums around Mexico. Dibond material is an affordable, aluminum composite material (ACM) made of two lightweight sheets of .012” aluminum with a solid thermoplastic core. The material is intended for such applications as point of purchase displays, exhibits and kiosks, framing, archival framing, interior signage and exterior signage as well as structural signage. Additionally, Dibond’s unique properties lend itself to very unique OEM industrial applications, such as engine covers, housings, etc.